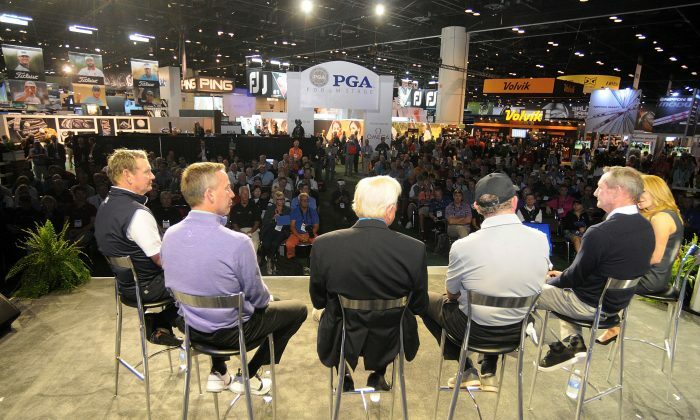 ORLANDO, Fla.—The PGA Merchandise Show in Orlando, which runs from Jan. 23–26, is geared to promoting golf as a recreational activity worthy of one’s time and money. However, since the financial crisis of 2008, the overall health of the sport is facing an uncertain future. Globally, America has the most players and number of courses, but in both categories, there’s been a marked decrease. In 2005, golf participation peaked at 30 million players in America. That total has fallen to just under 24 million, according to the National Golf Foundation. New golf course construction in the United States has essentially ended—with closures commonplace. Even high income locations such as the New York City metro area, which previously seemed immune to such situations, is seeing equity-owned private clubs shutter doors permanently. Many of the reasons center on an exuberant surge in course construction during the 1990s. Residential real estate in tandem with ill-considered golf projects went super-hot simply because of speculation-driven impulses. In sum, supply still exceeds demand for golf. Baby boomers have served as golf’s most active and loyal players. This segment provided the financial underpinnings for course construction, equipment, apparel, and other specialty purchases. As this group ages, there’s no guarantee younger generations will mirror their habits. The leading organizations gathering in Orlando either did not see or turned a blind eye to the storm clouds on the horizon early on. Many continued to express unbridled optimism when a more sober analysis would have confirmed the obvious. Some simply opined golf was experiencing a cyclical swing with few seeing the more obvious conclusion that a far deeper and unclear paradigm shift is underway. Leisure time, as defined now in the 21st century is a far different matter than when golf took root in the late 19th century. The sport grew as a mechanism to escape from the day-to-day nature of ordinary life. People willingly opted to schedule large chunks of personal time to enjoy the game and the outdoors. The world today encourages speed—cramming more and more into the 24-hour cycle. Brevity is the gearbox and those driving the recreational vehicle of the 21st century do not want to be wasting time when much of the world is anchored to an incessant “go” mentality. The bigger question remains: Can golf really “go” in such a frenetic climate? The push at this year’s PGA Show is multi-targeted. Foremost, is getting millennials to adopt a game many view as the pastime of their forefathers. Beyond the issue of time is the inherent difficulty of the game with quality teaching failing to make its way to the broader masses. The cost of equipment has also proved prohibitive for many. Full sets of clubs today routinely cost in the thousands. Women still constitute no more than 25 percent of all players in America. Amazingly, in Germany, a country with little history in the sport, the women’s participation rate is over 50 percent. Throughout golf’s ascension in the 20th century, the country club served as a bastion for white male supremacy. The old time country club fostered elitism, often promoting chauvinism and outright hostility to anyone outside its orbit. The key for 21st century country clubs is somehow demonstrating relevance in today’s far more egalitarian world, centered on how best to embrace shared family connections. Introducing people to golf is happening on several fronts. The rise of Top Golf, the new high tech driving range model, has been quite impressive. But the longer term question remains—do people go to Top Golf for a desire to play golf or is it nothing more than a means to socialize and party with friends? Can Top Golf be the bridge bringing new entrants into traditional golf? Sixty percent of the people who come to Top Golf never picked up a club prior to a visit. Concurrently, several First Tee programs have been successful in introducing minorities to the sport, but will such interest continue into adulthood? Golf is now in the Summer Olympics so the added exposure does provide a platform for many different countries to take the game more seriously and invest in their own respective programs. Interestingly, when Tiger Woods launched his pro career in 1996, it seemed golf would surge to heights never seen. Now, more than 20 years later, the golf world faces a daunting prospect. Can an old game fit into a hip, sleek ultra-fast world where attention spans are shorter and the desire to attain instant gratification is paramount? In years past, the Orange County Convention Center would be teeming with exhibitors to the point of overflow. That’s not the case any longer. Behind the smiles exhibitors will exude from their display booths is a far deeper concern that golf has not really turned the corner, but actually whether the sport sees it when coming upon it. M. James Ward, a member of Golf Writer’s Association of America (GWAA) and past member of Met Golf Writer’s Association (MGWA), has reported on golf’s biggest events since 1980 through variety of forums.